The Onedin Line - the best television series ever ….. well that’s our opinion! The series was created by Cyril Abraham who had been writing for television and radio for a number of years prior to Onedin. He continued to be involved with the series up until his death at the end of the Seventies, writing twenty-two of the total ninety-two episodes which made up the eight series. The drama was made by the BBC between 1970 and 1980. For episodes titles and UK broadcast dates see Episode Titles. The Onedin Line began on television in 1970 as a pilot, one of three separate programmes in the Drama Playhouse category. The idea was to test the potential of each story, the audience being encouraged to write in with their comments - if the reaction was favourable, a series would be made. The BBC had done something similar the previous year and repeated the idea in 1972; all three of the 1970 pilots were eventually developed into series. The Onedin Line was by far the most successful of all the Drama Playhouse stories which became series, though The Regiment and Sutherland’s Law also became popular. “The wind blows free for any man’s use. A hundred years ago all a man needed to make a start - and ultimately a fortune - was a ship, the courage to risk his life in her and the cunning to survive in a cut-throat business. The main cast was identical to that of series one with the exception of Anne Stallybrass - Anne Webster/Onedin was played by Sheila Allen in the pilot. It would be intriguing to compare the two versions and in particular see the difference between the two actresses’ portrayals of Anne but, unfortunately, the pilot no longer exists. 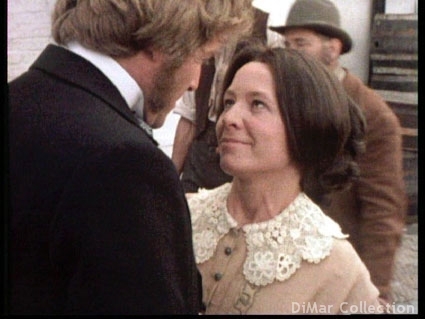 Incidentally, William Slater is the husband of Mary Webster who played Sarah Onedin. Peter Graham Scott was offered the job of producing the first series of The Onedin Line; he would also produce series two and three, direct several episodes and write one. Sheila Allen turned down the chance to appear in the series, something which, according to Peter Graham Scott, she later regretted. Thank heavens she rejected the role is all we can say! With Sheila Allen unavailable, Peter Graham Scott was able to offer the role to an actress he’d long admired, namely Anne Stallybrass. Another difference to the pilot was that filming moved a few miles along the Devon coast to Dartmouth and Exeter. The pilot was refilmed as the first episode of series one though some of the sea scenes may have been retained. The Onedin Line is remembered by most British viewers (including Diana) as a staple of Sunday night viewing throughout the Seventies but in fact series one was broadcast on Fridays at 9.20 pm. Nine of the fifteen episodes were repeated during summer 1972 and these were shown at Sunday teatime. The series quickly became a hit, the audience growing week by week. The Onedin Line returned to UK television screens in April 1976, 2¼ years after the previous episode had been broadcast. The long gap was partly due to Peter Gilmore not wanting to continue as James, fearing typecasting. The Onedin Line without James is unthinkable and it’s equally unthinkable for anyone else to portray James, so no Peter, no Onedin Line. Another reason for the delay was that the BBC hadn’t had the money in 1974 to make another series due to a number of other expensive projects. Having resolved the financial situation, the BBC pursued Peter and persuaded him to change his mind and return to the role which had made him famous. Then in summer 1975 just as they were due to start filming, a production assistants’ strike occurred which delayed production until early 1976. Series four was reduced to ten episodes and indeed the remaining series consisted of a similar number. There were several other changes, including a new producer for The Onedin Line, Peter Cregeen. In terms of the cast, Brian Rawlinson returned to the role of Robert Onedin which he had created, while the character of Daniel Fogarty did not feature, although he was occasionally referred to. In addition, Elizabeth was seen to take an increasing interest in her father-in-law’s shipping business, taking over its running after his death and becoming a major competitor to her brother, James, and thus adding another dimension to the series which was to continue throughout the next four series. Unlike the first three series, the internal filming was completed before the external - location filming took place mainly in Exeter. Regretfully, although Dartmouth was used during April 1976 as a base for filming at sea, Bayards Cove was not used, nor were other parts of the town. And in the interests of economy, fewer scenes were filmed at sea in series four; instead James became more shore based, frequently seen at his office. As series four opens, five years have passed and it is the year 1875. I understand that it was mutually agreed by the BBC and Peter Gilmore in advance that this would be the final series. Production costs had soared, not just for The Onedin Line though it had always been an expensive programme to make, and the BBC needed to save money; in addition, it was difficult to find fresh stories and not rehash those that had already been told; and after ten years Peter was, not unnaturally, growing tired of playing the same character. Series eight consisted of only nine episodes and brought further changes. Firstly, creator Cyril Abraham had died - this was the only series he did not write for, though it’s possible he contributed some ideas. In terms of the cast, Jill Gascoine had intended to continue as Letty Onedin as well as appearing in her new series, The Gentle Touch. However, this proved impossible when filming on the latter was rescheduled resulting in a clash with that of The Onedin Line. So for the second time James’ wife died, this time of diphtheria. Mary Webster also did not appear, Sarah having been sent abroad on a Cook’s tour. In their place came Roberta Iger as Margarita who swiftly becomes James third wife; Frederick Jaeger as Max van der Rheede seeking vengeance against James; and another new member of the Onedin family, Jenny Twigge as Caroline, Samuel’s new wife. So in 1980 after ten years and eight series consisting of ninety-two episodes, The Onedin Line finally weighed anchor for the last time, James, of course, having the last word. As previously mentioned, much of series one was repeated in the summer of 1972 as a lead in to the second series. Series one was shown again on BBC1 during 1986 - 87 when daytime television started. Ironically, as far as I’m aware, the only other series to be have been repeated on mainstream television was series eight, generally regarded as the weakest one, which was broadcast again in 1982. It wasn’t until 1992 that The Onedin Line was seen once more when UK Gold finally broadcast every episode on satellite and cable. So what made The Onedin Line such a popular series for so long? A combination of things in my opinion. When it began the programme was very different to anything that had been seen on television previously. Many scenes were shot on location whereas the vast majority of dramas were almost entirely studio bound. The stories, of course, were a major factor in its appeal. Obviously, some episodes were better than others but the writing throughout was generally strong. Having Cyril Abraham as a writer right up to the last series brought a certain continuity. It’s rare for the creator of a long-running series to remain so heavily involved for so long. Perhaps significantly, he did not write for the somewhat inferior eighth series. Distinctive and interesting characters who you can’t help becoming involved with - whether you love (Anne), like (Baines), feel sorry for (Charlotte) or loathe (William) them …… not forgetting the most important character of all, James Onedin himself whom most fans have probably loved, liked and also occasionally disliked at various times - though you can’t help routing for him even when he’s up to his worst. These characters were brought to life through some high quality acting. Peter Gilmore may be nothing like James in real life but he is brilliant in the role. Significantly, three of the key characters appear throughout the entire run, played by the original actors. And though faces came and went over the years, a high proportion appeared for more than one series. Working on The Onedin Line must have been a generally pleasurable experience for actors to have kept coming back for more. Excluding the pilot, there were only three producers responsible for The Onedin Line: Peter Graham Scott (series one to three), Peter Cregeen (series four) and Geraint Morris (series five to eight). Though the director changed from one episode to the next, the producers must have provided a sense of continuity and a consistent feel across the years - there weren’t numerous producers each imposing their own different ideas. No doubt this was also assisted by there being only two script editors: Barry Thomas and Mervyn Haisman, both of whom also wrote individual episodes. Not that mistakes weren’t made and some things just don’t add up. Anyone trying to produce a timeline for The Onedin Line faces an impossible task. In the early series it can be seen that Samuel and William are around ten years old when Charlotte is born while in the later series Charlotte is clearly only a little younger than her cousins. Equally, James is twenty-eight when The Onedin Line opens yet he tells Margarita in series eight that he is forty-seven - more like fifty-seven or even sixty-seven! The second generation Onedins appear to age considerably quicker than their parents. Finally, but no by no means least, the sea and those beautiful sailing ships played a very important part in Onedin’s appeal, as well as Khachaturian’s score for the ballet Spartacus. Strange to think this originally had no associations with the sea when a nautical theme seems to fit the music so perfectly. I admit I am biased but over thirty years on The Onedin Line is still in a class of its own. Very little on television these days even comes close. It’s just a pity we didn’t get to see what happened to the Onedins in the twentieth century as Cyril Abraham first visualised the family because the series creator had originally envisioned James when he was an old man. It would have been interesting to have had a story covering the last few years of James’ life. You can imagine him as a very wealthy yet lonely and often irascible old man; still dabbling in the business, refusing to hand over entirely to his descendants the shipping line he loved so much that he’d built up from nothing; only Elizabeth left who truly understood him and with whom he could properly discuss the past ….. can you picture James and his sister, blankets round them to protect against the drafts on a cold winter’s day, sitting in front of a blazing fire reminiscing ..…. talking about those they had loved and lost, the adventures they’d experienced, the good old days when sailing ships still ruled the ocean and steamships were in the minority …….